Experience the difference like no other !!! 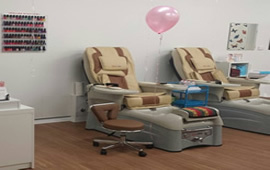 Suburban Nails & Beauty is a proudly South Australian owned and operated business offering our clients the highest quality treatments at very competitive prices. Our salon is located in Pooraka and is convenient if you live in the Northern suburbs of Adelaide or surrounding areas. It is our passion and guarantee to deliver the highest level of customer satisfaction through the wide range of nails and beauty treatments for both ladies and gentlemen. Kelly and John have over 10 years of industry experience between them and are fully qualified, having completed both Certificate III in Beauty Therapy and Certificate II in Nail Technology. Kelly and John keep up to date with all the latest industry products and services so you can have the up to the minute look. We understand the importance of hygiene, therefore we have put OH&S procedures in place to ensure correct sanitation is in place because our customer safety is our utmost priority. So come in and experience the difference, whether it be creating awesome nail artwork, or simply kicking back and enjoying our luxurious spa treatments, be assured to have the best salon experience like no other. This multi-step SNS process overlays directly onto the nail bed to create long lasting nails with exceptional durability and shine. The application does not use harsh chemicals, it eliminates the odor that are typically associated with acrylic and gels. The SNS process represents a completely new technology in nail enhancement. Older methods such as acrylic and gels create a barrier that can cause weak, brittle nails and can even promote the growth of fungus on the nail bed. Signature nails are water resistant, yet they allow natural nails to breathe, enabling them to grow long and strong. This is the same as the standard manicure & pedicure only with the extra exfoliating sea scrub and with the calluses removed and the longer massage will leave your hands and feet feeling fully rejuvenated. Prepare and apply an extension to the edge of your natural nails. Gel powder is applied for strength and durability. Gel powder provides a shiny, incredibly transparent and natural finish. Treatments include pushing back and removing excess skin from your cuticles, then cut, shape and buff your nails. Hand lotion and a mini massage are provided before final nail strengthener or polishes are applied. The shellac exclusive UV gel polish formula holds the secret to long-lasting shine and with Shellac there's no chipping, no smudging. When it's time to change the color Shellac soaks off easily in 10 minutes with no damage to your nails. Prepare and apply an extension to the edge of your natural nails. Acrylic powder is applied for strength and durability. Then we length, file, buff, shape and polish to your preference. If you are just after a quick colour for your nails then Buff, Shape and Polish is the answer - it involves filing, buffing, shining of the nail and applying a colour of your choice. A refill is required every 2-3 weeks after acrylic/gel set has been applied, depending on the growth and condition of your nails. The part that grows out will be filled with acrylic or gel, cut down, shape, buff and polish applied as desired. Nail bed prep and acrylic powder is applied onto natural nails, providing extra strength and shape without adding any length extension which make your nail very natural. The spa pedicure chairs will massage your back, head and shoulders. Your feet will be soak in sea salt, cuticle tidy, dry skin removed, toe nail is shaped, buff, plus a mini feet massage and finished off with a colour of your choice. Appointment requests will be responded to within 24 hours.